As the summer sun rises above the mesa edge, people in the village begin the day. Suddenly the early-morning silence is broken by the melodic voice of the village crier, who has exciting news. A Butterfly Dance will take place in four weeks. The men of the village are invited to go to the kiva in the evening to start gathering the songs for the upcoming dance. 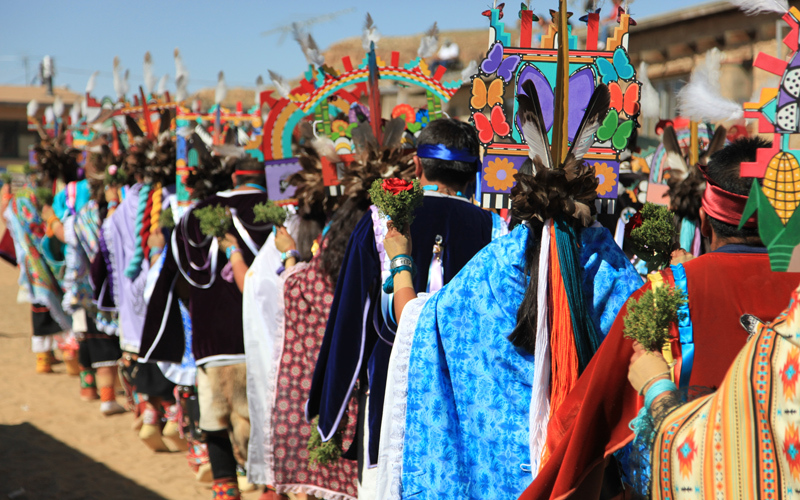 The Hopi Butterfly Dance is a two-day, ceremonial social dance for young people. 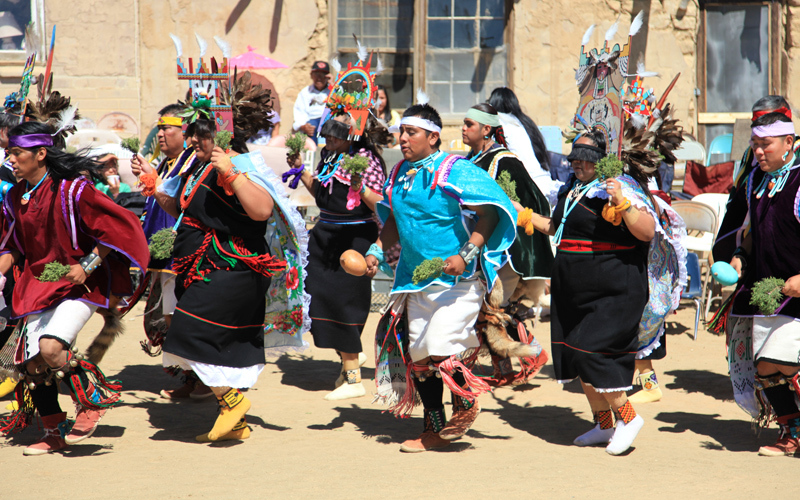 During late summer and early fall in northern Arizona’s Hopi villages, the dance takes place when a person or family decides to sponsor it. Ceremonial arrangements must be completed before the village crier’s announcement. The village men provide the prayer songs for the dance. They select the songs and practice them in the kiva, an underground chamber where all Hopi ceremonies are conducted. Often evoking the world’s natural elements and nature’s gifts, the songs thank the Creator for the Hopi way of life. When the songs are ready, young people who wish to participate are ceremonially taken to the kiva to practice dancing to the songs. Only young, unmarried girls may participate in the dance. The girl’s partner is a clan relative on her father’s side. The relationship between the two is friendly and teasing. The boy may be called her boyfriend, but, as clan relatives, they are not allowed to marry. During ceremonial preparations in the kiva, village elders guide the young participants in proper ways and appropriate behavior. At home, in the days before the dance, a girl’s mother and grandmother also guide her in proper behavior and the ceremonial meaning of the dance. The girl learns what it means to be a young Hopi woman and her purpose and meaning within Hopi culture. 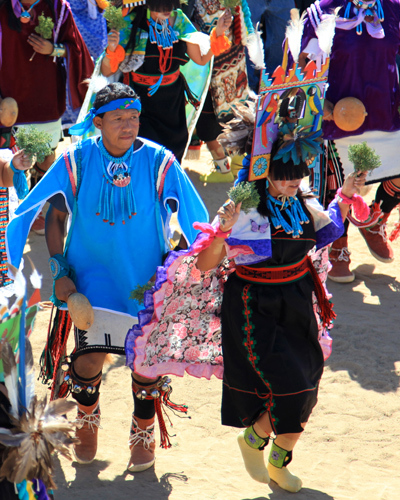 The young people learn all thirty-two songs that will be danced during the two days, along with each song’s movements. The lead singer encourages the young people to feel the messages of the prayer songs. When necessary, the men describe the appropriate hand and foot movements, and they interpret the songs’ meanings to ensure that the participants understand. The evening before the Butterfly Dance, during the last practice dance at the kiva, the girl gives her partner food that she and her family have prepared for him. The young girls wear their dress-up mantas for the dance. Early on the first morning of the Butterfly Dance, the girl’s partner takes her to his mother’s house to complete her ceremonial dressing. The family dresses her in hair bangs to cover her eyes, a colorful dance scarf, anklets, and jewelry. The girl’s new kopatsoki (headdress), created especially for her, is carefully placed and secured on her head. The colorful designs on the kopatsoki present her clan symbols and may include a symbol of her partner’s clan. Finally her feet are painted yellow, a color that represents the eagle’s yellow feet and will enable her to dance lightly throughout the day. During the pre-sunrise hours of the dance day, the village plaza is ceremonially prepared. The people in the village understand their responsibility in helping to care for the plaza during the dance. The butterfly dancers appear in the plaza in two lines facing each other, each girl holding fragrant pine boughs. The older girls and their partners dance at the head of the double line, with the younger dancers following. Everyone dances lightly, keeping time with the drumbeat, and the dancers’ hand movements interpret and emphasize each song’s meaning. At appropriate times during the dance, the boys shake their hand rattles for emphasis. With their family and/or clan relatives assisting, the sponsoring person or family provides the midday meals each day for the dancers and singers. The offering of the meals demonstrates thankfulness to the singers and dancers for participating. A brief speech of thanks may also be made after the food has been provided. Throughout the dance, the girl wears the kopatsoki proudly but in an elegantly humble way. Afterwards, the girl receives the kopatsoki as a gift from her partner, along with a new shawl and a basket of groceries. Other family and clan relatives of the boy may honor the girl with additional gifts of grocery baskets. Weeks after the Butterfly Dance, the young girl and her family repay her dance partner with traditional Hopi foods that they have prepared. For each shawl the girl has received, she gives a specially woven basket. The offering of reciprocal gifts is a way of recognizing and accepting special family relationships. 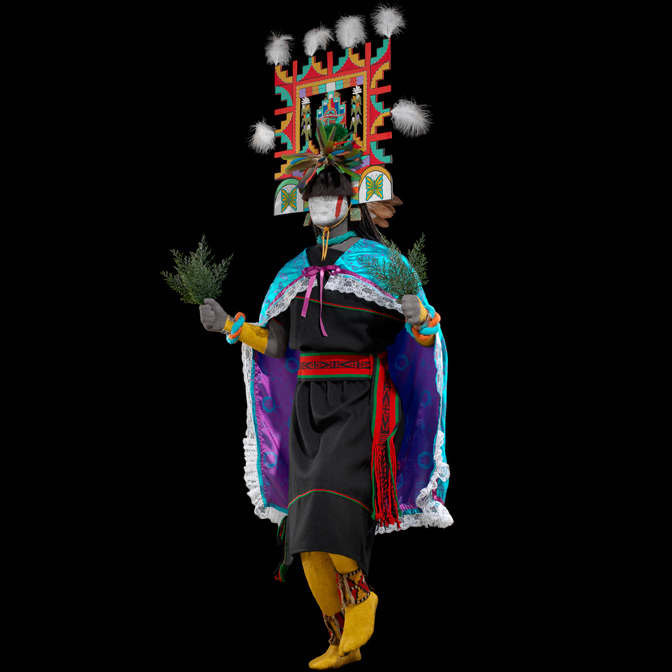 Gloria Lomahaftewa (Hopi [Cloud/Water Clan]), Songopavi Village, who is of Hopi and Choctaw descent, is an enrolled member of the Hopi Tribe. She has twenty-five years of experience in curating museum exhibitions and collections, consulting with tribes about museum collections, conducting tribal community outreach, developing educational programs, interpreting cultural materials, and in museum administration. She is also a Native American Graves Protection and Repatriation Act specialist. Lomahaftewa was formerly a curator at the Heard Museum and the Museum of Northern Arizona. She lives on the Hopi reservation, working with Hopi Cancer Support Services, and she is actively involved in a project to construct a tribal museum, language, and archive resource center. 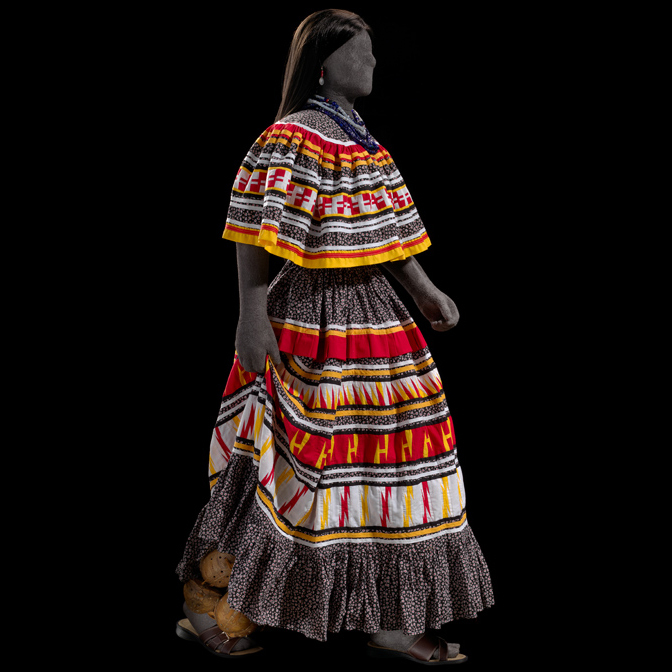 A girl’s or young woman’s ceremonial dress for the Butterfly Dance is composed of a traditional Hopi dress (a piece of woven black cloth fastened over the right shoulder, leaving the left shoulder bare and reaching to the knees); a woven belt, often dyed black, red, and green; a brightly colored, lace-trimmed, cotton shawl; and anklets. The most striking components of a girl’s outfit, however, are her headdress, called a kopatsoki, and black hair bangs, which cover her eyes. The girl receives the kopatsoki as a gift from her dance partner. It is made specifically for the girl by the boy or one of his family members. 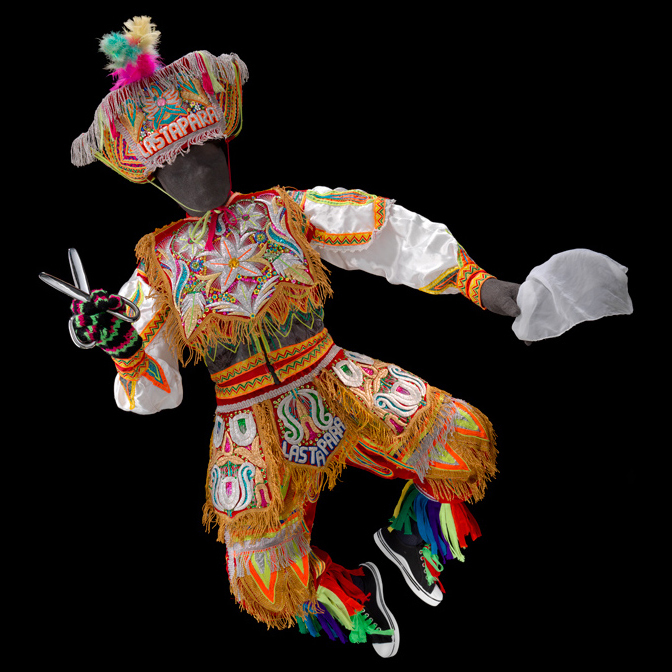 The imagery includes symbols of the girl’s clan and sometimes of her dance partner’s clan. The central figure on this headdress, situated between stalks of corn, is the Niman Katsina. Rain clouds border the edges of the kopatsoki. Headdress and wristbands, 2011. Made by Lavelle Frayne Mahle. Hotevilla, Arizona. Wood, paint, parrot feathers, leather, yarn. 26/8785. Hair Bangs, 2011. Made by Palmer Lomakema. Phoenix, Arizona. Hair, cotton binding, thread. 26/8786. Earrings, 1929. Wood, turquoise. Arizona. 16/6629. Necklace, 2011. Made by Moonte Sinquah. Arizona. Turquoise. 26/8833. Manta (Dress), 1950. Made by Frank Gaseonema. Arizona. Wool, dye. 24/7776. Scarf, 2012. Made by Jeanette Sahneyah. Arizona. Cotton. 26/8832. Sash, 1965. Made by David Tewamanewa. Second Mesa, Arizona. Wool, dye. 25/5435. Anklets, 1919. Third Mesa, Arizona. Canvas, wool yarn, hide thong. 9/566. Bracelet, 1970. Made by Manuel Hoyungawa. Arizona. Silver, turquoise. 25/6226. Bracelet, 1982. Made by Michael Kabotie (Lomawywisa). Arizona. Silver, turquoise. 25/6329. Photograph by Ernest Amoroso, NMAI.